I’m from the North American east coast, and I am very familiar with boating and boats in general. I grew up not far from the beach, and a lot of people has boats. One thing though is that some boat engine can be very loud. In this article, I will be explaining several methods for boat motor noise reduction. How to reduce noise from a boat engine? Reduce noise from a boat engine by installing some sound dampening material into the cowling. Self-adhesive butyl rubber anti-vibration membrane w/ aluminum layer is what I recommend. Of course, this is just one solution in reducing boat engine noise. The method above is specifically for outboard engine noise reduction. There are other types of boat engine soundproofing methods I will be discussing. Why Is Engine Bay Soundproofing Important? Engine bay soundproofing is essential because “a quiet boat is a good boat.” That’s what my uncle used to tell me; it’s like a car when an older vehicle starts making noise you know the car is not in prime condition. A boat is the same because as boat ages, you will begin hearing more engine noise and more overall noises throughout the boat. New boats are quiet, and when something like a boat or car is quiet while running means, they are well engineered, dependable and gives a comfortable ride. I don’t know about you, but when I was on my families boat, I found it so relaxing to anchor somewhere to have a peaceful afternoon. The boat engine would be off for most of the time, but while cruising, we had a boat with an engine that made a terrible noise. It was basically the noise of an engine but intensified ten times over. We couldn’t wait to get to where we wanted to go and shut it off to have some peace and quiet. It was also a bit embarrassing traveling around the river with that noisy monstrosity. When I was younger we never really thought about soundproofing a boat engine, so my father eventually traded it for a newer model, like the majority of people would have done. I wish I would have had an article about engine bay soundproofing to show my father; I could have saved him a few dollars! The reason for that saying is apparent; you’re happy on the first day of having your new toy but so happy to finally get rid of the boat after you find out that it is not as relaxing and all its cracked up to be. 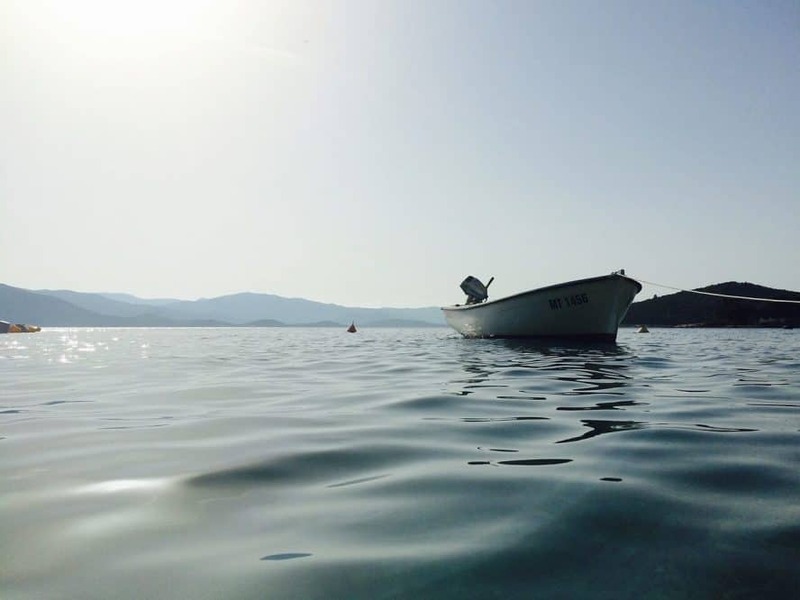 Let’s try to make your boat ownership the best decision you’ve made to have your summertime fun; by possibly fixing a significant noise problem that will cost you very little money and even less work. 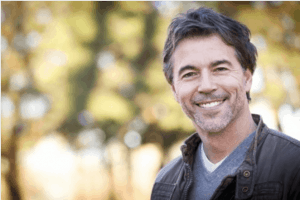 The side effects of loud engine noise I am referring to is concerning your health. The sound of a boat engine can exceed well over a hundred decibels. If not adequately insulated the engine noise can negatively affect your hearing. The sound pressure is measured in decibels, and like the temperature scale, decibels can go below zero. Someone with terrific hearing could hear a sound at -15 decibels. You enter the danger zone when the noise is over 85 decibels. Above 85 decibels is when you can begin to suffer some severe damage to your hearing. If your boat engine puts out a constant noise of over a hundred decibels, you will eventually begin to feel the effects of hearing loss. If you’re looking for a used boat, you might want to consider adding some new sound absorbing material where noise persists. The reason for this is because the life expectancy of most sound absorbing material that is installed in boats today is approximately ten years. Some people might get confused when they hear a ten-year-old boat making more noise than its five-year-old counterpart and think there is something wrong with the engine. Before assuming that you need someone to tinker with the motor, take a look at the sound deadening material in the engine bay for any wear and tear. It might be time to rip out the old material and replace it with a fresh new sound deadening product. After years of enduring moisture from either fresh water or salt water, the sound deadening material will lose its effectiveness as it breaks down. A few cracks here and there will make the engine noise easily pass through them and make for a loud voyage. Not only that but every year the boat is running, the vibrations from the boat will get more prominent; and will result in loosening bolts throughout the ship. After the bolts have loosened to a certain extent, you will begin to hear more and more rattles and squeaks. These noises will make your boat sound older every year. If you want to avoid your boat sounding old and loud, you will have to make sure the sound insulation material is kept in tip-top shape. The sound insulation material in the engine bay will not only reduce noise but will lessen the vibrations coming from the engine. I see some individuals around the internet WRONGLY suggesting material that is not an appropriate certified marine grade product for use in the application you are intending. Fire and also water resistance are necessary. Get the right stuff or hire your dealer to perform the job. Engine rooms can be noisy, hot with a potential for fire. There are different types of noises that a boat engine will make. You will need to carefully inspect the current sound dampening material to see if there is damage and what you need to fix it. Structural born noise is when the boat is physically vibrating and causing multiple squeaks and rattles due to loosening bolts and fastening. It is the actual impact of an object on a building element, in this case, it would be a boat. In most cases structure born noises are the hardest to isolate versus airborne sound; because the sound waves are a result of both sides of a building material vibrating. The reason they are challenging to isolate is that there are usually multiple sources. Luckily in the case of a boat, the structure-borne sound would typically come from the engine bay, and that makes it easier for us to mitigate. Airborne noise is the sound waves that are transmitted through the atmosphere. In this specific case, the airborne noise would come from the engine and other areas of the marine craft. You can reduce the amount of airborne noise by physically blocking the source of the noise with noise blocking material. You will not be able to block the engine noise completely, but you can bring it back to what it sounded like when the watercraft was new, or at least close to new. Airborne and structural noise is almost always intertwined when the sound is loud enough. If the airborne noise is loud, it can cause a structure to vibrate causing structural noise and vise versa. While the majority of engines have a cover, it generally does little to minimize noise. This engine cover, called the cowling, is mainly inefficient regarding noise reduction unless you supplement it with something far better. Consult your boat owners manual before removing the cowling. The engine covers on marine crafts are usually very sturdy, but you could still do some internal damage if you’re not careful. You definitely do not want to have engine trouble in the future because of this DIY soundproofing project. Now that you’ve removed the engine cover you’ll see if the sound dampening material shows signs of damage. You can either remove the old sound dampening material or place the new stuff on top. If you place the new material on top of the worn one, you could be doubling the noise reduction effect; but you could also be defeating the purpose of adding new material if the old one creates gaps that will let noise bleed through. One thing I need to point out is that this will not solve the noise problem for every situation. There could be other factors as to why the engine noise is unbearable that simple boat engine cover insulation will not fix. The cowling is off, and now you’re wondering what kind of sound dampening insulation you should buy. Not all noise insulation are created equal. You will need soundproofing insulation that is not only heat proof but waterproof also. There are some great insulation out there made for vehicles that are heat proof but not waterproof so make sure you read the label carefully if you’re buying this at your local hardware store. The outboard motor cowling insulation I recommend is the Stinger Road Kill product from Amazon. This stuff is waterproof, moisture proof and heat resistant. This stuff works well in eliminating a broad spectrum of sound frequencies. The max loaded vinyl is very dense and also flexible and contains Barium Sulfate to increase its density. When installing the sound dampening material in the cowling make sure not to cover the air vents while covering as much surface as possible. There will be some noise coming from the air vents, but this is unavoidable. Make sure the material does not come into contact with any moving parts, mainly if you are sticking it over the existing cowling insulation. I did see some people online suggest a placing a cowling cover, the covers you put over the cowling while traveling to avoid rock chips. These types of motor covers SHOULD NOT be in place while you’re cruising on the water. The cover is strictly for when you’re traveling on roads or when the boat is in storage and not in use. Please do not believe everything you read online because some soundproofing websites have very misleading information. Wrong information could end up overheating the engine and cause significant damage. I’ve done some research online and by talking to some boat owners about how to minimize outboard motor noise the DIY way. I came across something interesting. 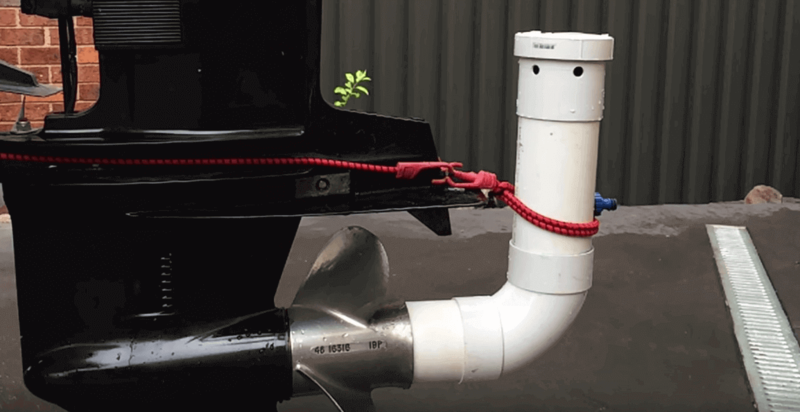 A boat owner built a simple muffler system using a PVC pipe. They call this an outboard motor silencer. I have to confess that I have never built this or even seen it in real life, but know someone that swears by it. There is also a YouTube video explaining the process. As the picture above shows is that all you need is a curved PVC pipe with a cap on the end. Drill a few holes in the pipe close to the end cap using the water column as a sound baffle. This design can comfortably accommodate multiple propeller exhaust sizes. This method for reducing outboard motor noise has a few added benefits; by giving a consistent back pressure that is consistent with a normal operation of the outboard motor when it is submerged in the water. This will lead to a much smoother idle and a faster prime of the water pump and tell tale. Having this attachment will slow your boat down, that is the side effects of having a cheap fix for a loud boat motor. Read some of the comments in the video below for an insight into how this method worked for some boaters. Inboard motors are much less of an issue when it comes to sound proofing because they are already pre-insulated. If you find that your inboard motor is noisy while the hatch is closed then there is most likely something wrong with the engine itself. A noisy boat motor can still be a problem even with an inboard engine because there can be cracks in the noise dampening insulation. All you should need for this small soundproofing project is some self-adhesive project is rubber insulation matting. You can use the same insulation as I recommend for the outboard motor cowling insulation because of its heat resistance and the fact that it is also waterproof. Make sure that when you’re sticking the sound insulation within the motor area that you do not block any air vents. If you block any of these vents, your engine will most likely overheat so watch out for that. It is usually common sense, but sometimes even I make simple mistakes when my mind is not in the right place. Marine engine noise reduction can be an easy DIY project. Especially if you know what you’re doing and you use the recommended products. If after reading this article and looking through your owners manual you’re still unsure on how to reduce the noise of your boat motor then you should let a professional look after it to make sure its done right. If you didn’t find what you were looking for in this article, then I recommend searching the Reddit forums for boat motor noise insulation. There should be a few people asking the question, and usually, the people responding are people that have first-hand experience on this type of issue. Thank You for checking us out! Please leave us a comment below if you have something to add that we might have missed, we love hearing your input so we can better our content going forward. Don’t forget to also check out our YouTube channel for some awesome soundproofing videos.